Before step 2, mp4 files were being displayed in firefox (like youTube etc). After step 3, I noticed that mp4 videos are playing using vlc (in browser). I disabled tha vlc plugin and now firefox is asking what to do with the file (the download menu appears). In the Options->Applications I see the following. 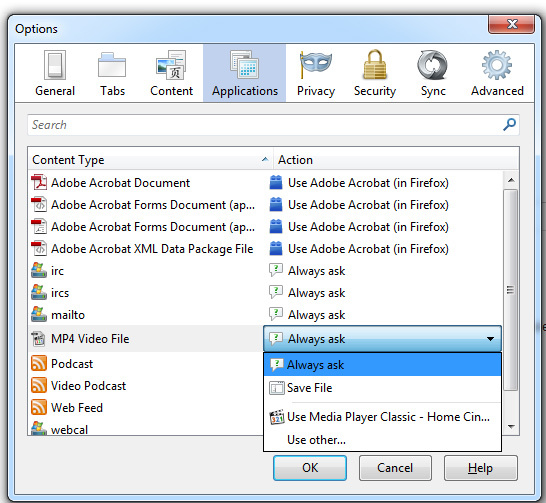 There is no option such as Use Flash player (in Firefox) like the adobe acrobat plugin. I tried installing flash player again but with no luck. Is there a way to fix this without ruining this Firefox profile? I am refering to mp4 and firefox because using chrome and right-clicking on video I see the flash player context menu, and in firefox by clicking the video (that is just blank, without the player) I am getting the download dialog. Browse other questions tagged firefox firefox-extensions or ask your own question. How do you associate an action with a file type in Firefox 3.0? How do I Install Flash Player 10 without Adobe Download Manager? Install Flash Player on Firefox w/o admin access? How to play Facebook videos without Adobe Flash player using Firefox? How do I get Adobe Flash Player to open files on the net again?